We looked at Kimonos and then drew them. We then put a paper that was the texture of a coffee filter over it and traced with a white (some chose black) oil pastel. I also looked up the children's names in Japanese and we wrote this down the lapel. Then we painted inside the lines with ColorSplash liquid watercolors. 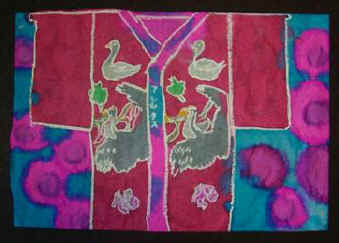 Brenda was inspired by the Kimono collagraph lesson by Ken Schwab. Barbara has done these Japanese Origami dolls with fifth grade. She suggest working through at least one yourself first to work out any problem areas. See pattern and adjust size to your needs. See lesson plan for details. Barbara also does a folding Japanese/Chinese screen. See Chinese Screen assemblage instructions - more details to come. 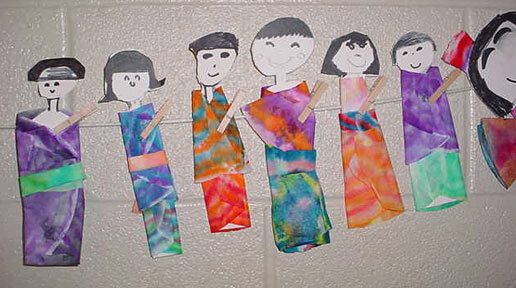 Roberta Dunkel also made the Japanese dolls with her art students. 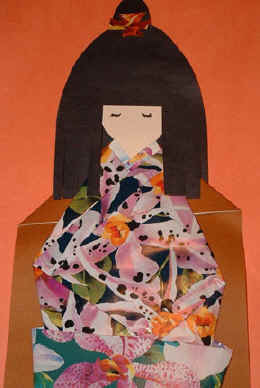 They used flat ice cream spoons for the head - glued it inside the paper kimono. This was with first grade. They also painted Hokusia's "Great Wave" in white Tempera Paint on blue paper. Dolls use semi- transparent leather known as "Kikawa"
Jeryl did the Fulbright trip to Japan so she had lots of things to show them. She had several Kokeshe dolls and the background on that (farmers carved them for dolls for their little girls). Kokeshi are minimalist figures made in the northern region of Japan. 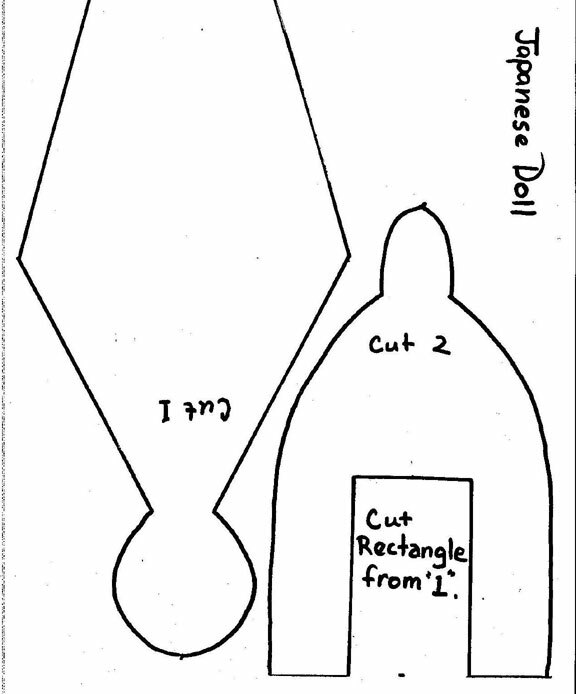 Basically, a kokeshiis made of two simple lathed pieces of wood--a cylindrical body, with a somewhat thicker and rounded head. A few thin, painted lines define the face, and the body has a floral design painted in red, black, and sometimes yellow. Students drew the doll on Tag board , colored it and cut out, then used AquaMarkers on coffee filters. Filters were sprayed with a bottle, (They folded them and only colored one section and sprayed it while it was folded). The next week they used the filter to dress the dolls. Jeryl also had lots of photos of children in kimonos to show them from her trip. 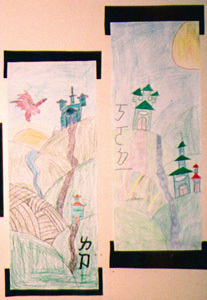 Submitted by Sky McClain: Sky McClain's students all did a unit on Japan. First they all saw an excellent movie on Japan called "A Kids View of Japan." Kristi Yamaguchi (Olympics skater) is narrator. (No longer available. A good substitute is The Little Travelers Japan) Her first graders painted fish kites, second made a family of origami swans on a paper pond, third graders - fake food, fourth grade - scrolls of favorite natural places they've visited, and fifth grade did lino-cut fish prints. See Sky McClains' Art Room site for more ideas. Sky McClain did Japan as a theme this year. 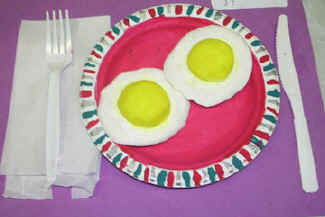 Her third graders did fake food called gyodan in Japan. The Japanese study the art of gyodan for seven years before they are considered professional. They make it out of plastic and display it in restaurants. This allows one to SEE what's on the menu. Students used Crayola Model Magic. 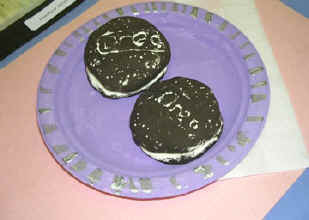 They painted the food and the paper plates with Tempera Paint . They mixed their own colors. 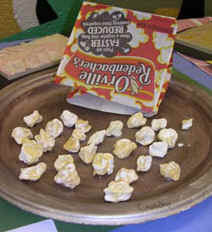 Many people have now seen the fake food display samples that Japanese restaurants use to advertise their menus. But did you know that this is a craft with an 80 year history, and all models are still individually hand made by master artisans? The idea originated in a small mountain town in Gifu, and you can still visit a traditional workshop there. See also The Art of Japan and Fans for Japan.